One of our Y Life missions is to spread LOVE throughout our generation, not hate. The topic of Bullying happens to be one of those things that truly pulls at our heartstrings. It’s hard to understand the effects of Bullying, especially if you have never been directly affected by it. It is a vile way of hurting someone, all the while, allowing a bully to feel as though their particular insecurities are being forgone, simply by using someone else, sometimes more vulnerable, as the scapegoat. When we heard that one of the Miss Florida contestants was making Bullying her mission platform, we thought Y Not help her bring awareness too! As a recent graduate from the University of Central Florida with a degree in Marketing… The second we encountered Meagan we knew she would be the perfect voice to talk about her mission … Bullying! “Miss Florida is a scholarship pageant and preliminary competition to Miss America. 48 girls are competing for the job as Miss Florida this week in a private interview, talent, evening gown, and on stage question. I fell in love with the pageant world after my first pageant four years ago – Miss Homestead. What inspired you to make, ‘Bullying‘ your platform? may not understand the tribulations of ‘Bullying‘? Where would you like to see ‘Bullying‘ go in the next 5 years? their children in hateful behavior… and to make it completely unacceptable. As of recent Prince William and Catherine have not only encouraged internet companies to fight against online bullying, but they have been quite vocal about the subject matter. Do you think having such voices speaking out about ‘Bullying‘ will help the conversation? “From a young age I have detested bullying in all forms,” the Duke of Cambridge said while speaking at the Founders Forum, a technology conference. “As Catherine and I started our family a few years ago, I was alarmed by the increasing reports of online bullying that were making headlines around the world.”… “From the girls developing eating disorders after being subjected to a campaign of abuse on social media, to the teenage boys who took their own lives following constant targeting –- as a parent myself, I was appalled,” said William. Miss Florida is hosting a People’s Choice contest, where the public is able to vote for their favorite contestant ($1/vote) until June 30th and the contestant with the most votes will earn a spot in the top 11! 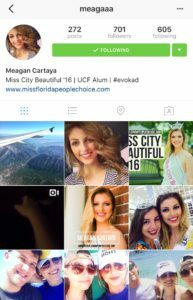 Also, you can follow her on Instagram, @meagaaa, for all the latest during Miss Florida!